Having fresh, clean water to drink every day makes for a healthy body. Much of the water that flows from the tap is not as clean as you think. While it meets minimum standards of cleanliness in most areas of the United States most of us would be a little shocked at what is lurking in our kitchen faucets. Find out what is in your city’s drinking water – you can read a water quality report from the Environmental Protection Agency for your state. The EPA’s website publishes the contact information for community water systems in the United States. Knowing what contaminants might be in your water is the first step in deciding what kind of countertop filtration system to purchase. Determine how much water you will consume every day on average – most countertop filtration systems are designed for a family of one to six people, plus a pet or two. A family of ten with two or three dogs and a cat will need more water than a countertop model can provide. 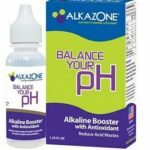 Pick up some pH strips to see how alkaline your tap water is. It should be at least a 7 on the pH scale, and if it is lower, you have acidic water. This is not what you want. More alkaline water has several health benefits, and a counter-top water filtration system can help you ensure your water has a proper pH. Space – do you have adequate counter space to accommodate a water filtration system? If not, you might want to consider an under the sink model. 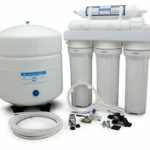 I have selected three of the top-selling countertop water filtration systems to review in a range of prices to make finding the right one for your needs a little easier. These are all gravity water filters, so no electricity is needed. 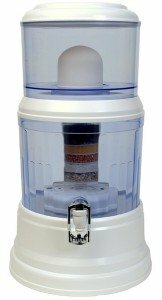 This is one of the best countertop water filtration systems on the market for around $80. Most users have nothing but good things to say about the unit and whenever they had a problem, customer service was right there to resolve it. It is compact and stylish with a great spout for dispensing the water. Makes very clean, pure alkalized water using healthy mineral stones with calcium, zinc, and magnesium. It does not make the water very quickly, but that’s because it has such an extensive filtration system. The first time you use the Zen countertop water filter, it may take 12 hours to fill the basin. After that, the time will be considerably less, but may still take 3 or more hours. Replacement parts and filters have to be ordered from the company directly. 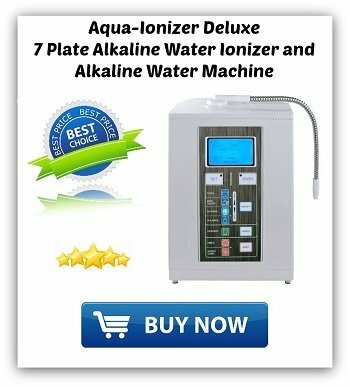 They are available on the Zen Water’s replacment filters page. Click here to read more about the Zen Water Systems Countertop Filtration System. This model is on the medium end of the price scale at $180. However, when you consider the cost of buying bottled water over and over, this will pay for itself after a year. This is a gravity-powered system that not only cleans your tap with a multi-filter system but also re-mineralizes the water to make it more alkaline, which has many health benefits. Granular activated coconut carbon filters chlorine, pesticides, chemicals, and heavy metals. This stage also improves ORP. Crystal clear great tasting water – users of this system, even those who had issues with their unit, say the water is incredibly clean, odor free and taste good. Filters and alkalizes – the more filters the cleaner your water gets. Having good minerals put back in the water before you drink it is an added bonus. Most of the reviews of this unit were very favorable. Since it is one of the more expensive models, you can bet people are going to complain loudly if it doesn’t live up to the investment. 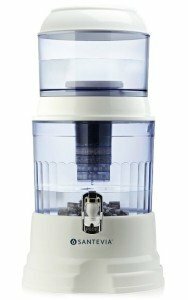 Since the customer service seems to be top-notch, the Santevia model is a good choice if you are serious about saving money over the long-term on bottled water and filters. The Berkey Water Filter is at the top of the price and might stretch your budget a little. It normally retails between $228 and $250. The reason for the higher price is the materials. It is made from stainless seal which most people prefer over a plastic unit. Although the Berkey water filters are higher priced than some, most people think it’s worth the cost. They consistently get some of the highest customer reviews. The travel size Berkey is good for a smaller family of up to four. Many also take this size on vacation or even on camping trips. 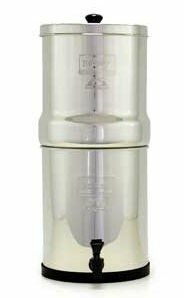 They also make larger sizes like the Big Berkey which holds 2.1 gallons of water and the Royal Berkey that holds 3 gallons. Made from stainless steel. The only plastic is inside the spigot. This is a huge selling point for most people since the stainless steel will last a lifetime and not impact that “plastic taste” you get with some water filters. When not in use the upper chamber fits inside the lower section, so is only 12 inches in height. This makes it easy to pack if you want to take it with you on a trip. Testing was performed by independent EPA laboratories and results exceeded the EPA standards. A few people complained that the filter started leaking from the spigot after several months. If you overtighten the plastic wing nuts, you can strip the threads causing the leak. You can buy replacements parts directly on the Berkey website. Care must also be taken when filling the unit. It is recommended to not overfill the top compartment when the bottom compartments are not empty, or this could also cause leaks. It is important to read the instructions that come with the unit to prevent this type of problem. 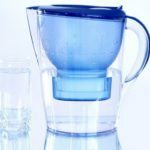 Following is a comparison table of the important features you should consider when purchasing a water filter pitcher for your kitchen. Filter Process 5 Functions: Filters, Purifies, Mineralizes, Alkalinizes, Magnetizes 8 stage purification process Unique filter process using microfiltration, absorption and an Ion exchange process. Countertop filtration systems are a very good option for those a lot of reasons. If you are renting and cannot install a permanent unit, if you have limited space under your cabinets or just want to have an easy alternative to buying bottled, then one of these countertop models makes sense. To have access to pure, clean alkalized water for drinking, washing produce and cooking is essential for good health. Anytime you are drinking more water, that’s an investment in yourself that everyone should make.